Not happy with the current way of mixing, pouring and storing your paints and finishes? Rockler has a new product called the Mixing Mate that does all three; and I think the person that came up with the design did it over a plate of pancakes. 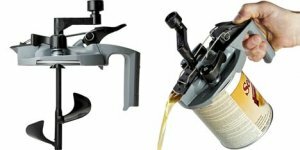 The Mixing Mate does look an awful lot like a syrup dispenser, and dispensing liquid is part of its job, but it also has a few other features. A tool-free cam a used to clamp the Mate onto a standard quart sized canister and a lid gasket provides a leak proof seal. The pouring spout has been spring-loaded to self close and seal on its own. The real innovative feature of the Mixing Mate has to be the mixing paddle. It has been designed in a shape similar to an auger so that when you spin the handle it actually lifts the pigments that have settled to the bottom of the can. The Mixing Mate costs $14.99 and is available at Rockler.